On Tuesday, we presented a slice of our project at the APT 2013 Conference, at Greenwich. Our presentation was in a session with two others, including one about the DIAL project at the University of the Arts. The Conference’s theme was, “Next Generation Learning Spaces and Work Places”, and disruption was a central theme, so we focused on the way in which our students experienced institutional requirements as disruptive of their studies. The slides are available on Slideshare, and are linked from our talks and papers page. This entry was posted in Project presentation and tagged APT conference, digital literacies, disruption, Greenwich on July 4, 2013 by Martin Oliver. Last week, we made our first presentation on the curriculum design elements of the staff intervention study. We gave the talk at the Researching Work and Learning conference in Sterling, to a select but very engaged audience. The talk focused on the material practices of curricula work, setting this in the context of wider debates around the curriculum in higher education. The presentation is available on slideshare. This entry was posted in Project outputs, Project presentation and tagged curriculum, researching work and learning, sociomaterial theory on June 27, 2013 by Martin Oliver. It’s inevitable, but nevertheless frustrating, that it’s taken so long for formal publications relating to the project. However, two things have now made it to press – a book chapter in a very interesting collection on the Digital University, edited by Robin Goodfellow and Mary Lea, and a short journal paper in the new Irish Learning Technology Association journal, following on from the keynote we gave at the ILTA conference last year. The paper is open access, and so available online. It has also embedded the video of the keynote we gave. References to both can be found on our publications page. This entry was posted in Project outputs, Project presentation and tagged digital literacies, digital university, publications on June 13, 2013 by Martin Oliver. Yesterday, Lesley and I gave a presentation on the project at Leicester University. This was delivered to a rather select group in the room, but also webcast to a wider audience. We almost made it through without technical hiccup… but not quite! It was very interesting to present this work, which was focused on our graduate students, to an audience that included graduate students at another institution. It also provided a very interesting space in which to discuss methodology in quite a frank and productive way. This entry was posted in Project outputs, Project presentation and tagged digital literacies, Leicester university, Presentation, sociomaterial theory on June 13, 2013 by Martin Oliver. We’ve just given a presentation and workshop at the 20th SEDA conference in Leeds, and it seemed to go off pretty well. As part of the presentation we asked people to draw maps of their own work, marking in places, devices and also times and movements, to get them to see just how powerful this technique has been for starting conversations and providing material for analysis. This led to some really interesting questions and discussions, about the connections between the digital and paper-based literacies, and about whether the kinds of coping strategies that students adopt are new because of the digital, or have always been this complicated. The programme has been really well represented at this event, with the professional bodies and DIAL projects also presenting. This entry was posted in Project presentation on May 17, 2013 by Martin Oliver. Is it merely a bunch of stuff and some string? Or is it an heterogeneous network of actants that has been engineered to achieve project completion? Either way, the cash has strings attached, digital devices are central an potentially oppositional binaries of new and traditional technologies (and texts) have been shown as linked. This entry was posted in Project presentation, Project progress, Related projects and tagged digital literacies, JISC, programme meeting on May 17, 2013 by Martin Oliver. Today, we’re giving a short overview of the project and its achievements to the Learning and Teaching Experts Group in Birmingham. The slides from our presentation are available here. This was also an opportunity to promote the special issue of Research in Learning Technology on digital scholarship, since this proposal came out of the JISC work. This entry was posted in Project presentation and tagged digital literacies, JISC, learning and teaching experts group on April 23, 2013 by Martin Oliver. We’re at the Theorizing the Web conference, and will shortly be giving our presentation, “Critiquing digital dualism: a sociomaterial account of student entanglements with technologies“. So far it’s been a good mix of presentations; it’s an interesting contrast to the educational and educational technology conferences we’ve been presenting this work at. The Twitter tag for the event is #TtW13, and for our session is #d2. This entry was posted in Project presentation and tagged #TtW13, digital dualism, digital literacies, sociomaterial theory on March 2, 2013 by Martin Oliver. Lesley and I have just given a presentation at the SRHE conference in Newport, titled, “Curating, combat or coping? 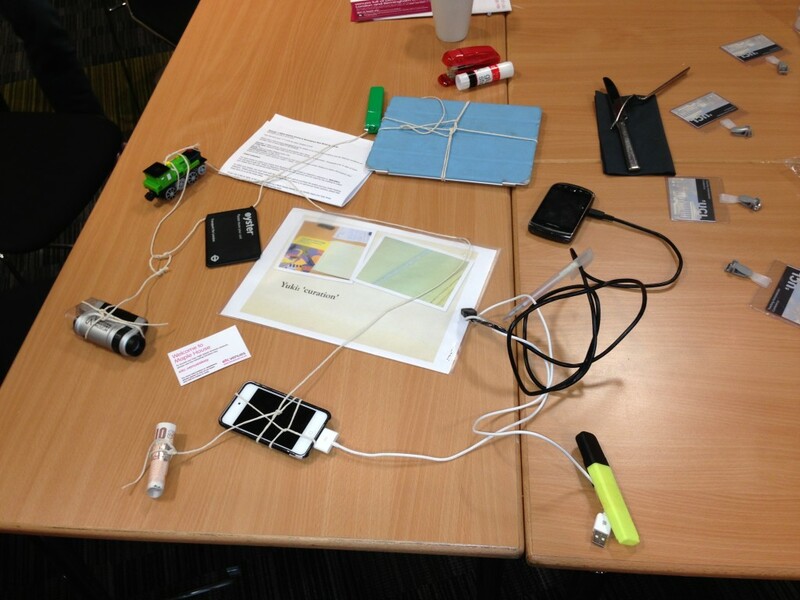 Student entanglements with technologies in HE“. We’ve made the slides available via Slideshare. This entry was posted in Project presentation and tagged digital literacies, SRHE, student experience on December 13, 2012 by Martin Oliver. At the London Knowledge Lab, we hosted a meeting with Prof Tony Bates and Maxim Jean-Louis, from Contact North, Ontario. They are looking to develop a research network around online learing. 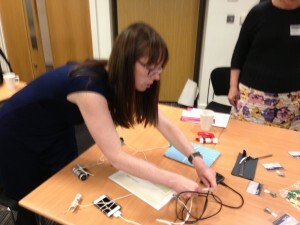 As part of this, we provided a briefing about this JISC project. The briefing seemed to be well received, and in addition to some quite specific questions, Maxim asked a simple but quite thought-provoking question: what from this research was most surprising? While I could think of some wonderful bits of data about student experiences, the answer I gave was a little more general: simply the incredible persistence, resilience and creativity of students as they persist – sometimes in the face of incredible difficulties – with their studies. This entry was posted in Project presentation and tagged canada, distance learning on November 21, 2012 by Martin Oliver. This project is hosted at the Institute of Education, University of London. It is funded as part of JISC's digital literacies programme.